Kwik Jet provides specialist drainage services to both commercial and public sectors throughout Central London. We are an independent company always on hand to help you make the right choice. When you have an emergency such as a blocked drain, a toilet overflowing, bad smells or your property is flooding, you need a solution and fast. Kwik Jet are dedicated to making sure you receive a fast and reliable service, and will ensure that your dealings with them are pleasant and that all your queries are answered clearly and promptly. We carry out a range of plumbing services for which we will provide a free estimate. We won’t charge for a call-out either. We can clear out any blockages to sinks, baths and waste disposal units and carry out emergency repairs including leaks, burst pipes and leaking stopcocks and valves. Common technique used to clear basic blockage with steel rods. Powerful water jets which strip deposits from pipes, flush out debris and restore flow. Flexible steel cables fitted with blades and cutters quickly cut through debris, tree roots and other deposits, restoring flow. These programmes are developed to spare respective clients the inconvenience of blockages, unpleasant odours, or health hazards. 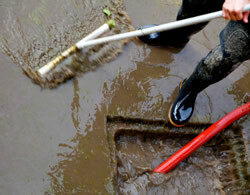 Maintenance contracts are a cost effective method of ensuring that your drains remain as clean as your reputation. A maintenance contract is drain and pipe cleaning on a regular basis, which helps to avoid blockages that can result in damage to property or stock, the potential health risk from flooding, the obvious inconvenience and, of course, unbudgeted expenditure. The idea is to keep the system flowing freely, so avoiding the problems associated with blockages and reduce flow. All pipework is different, the frequency and type of service depends on the amount of use the system gets. The substance being discharged. size of building and type and size of pipework are all contributing factors to the effectiveness of the system. Camera used to take a closer look inside pipes, drains and sewers. High quality colour pictures and graphical reports. Simply call us free on 0800 14 65 85 or via our online enquiry form to arrange a “without obligation” appointment. For more information on our drainage services give Kwik Jet a call on 0800 14 65 85 or alternatively contact us via our online enquiry form. We hope to answer all queries as soon as possible. Portable dehumidifiers suitable for flood damage to Offices and domestic homes. Now for hire.